We here at The Tweed know that you are very busy and important, and thus don’t have time to read all those silly style magazines. Yet you want to stay hip! So, we do the heavy lifting for you. Each month we read the glossy mags (for guys and girls), and round up the latest fashion trends. You’ll always be in style and you won’t have to flip through 3,000 Tommy Hilfiger ads. It’s a brand new year, and the fashion world takes that very seriously with all new clothing and accessories like minimalist watches. Most of the style mags are running “New Year, New You” articles, with tips on how to make over your diet, your wardrobe, your life. As far as clothing goes, the editors are looking forward to Spring, while most of the continental United States is just beginning the long trek through winter. While we’re all pulling out our coats and hats, the fashion mags are featuring sleeveless photo layouts and shoes with no socks (!). Here are the hottest trends you’ll be wearing when the weather breaks in about three months. Colored denim has been all the rage this fall, and now the designers have moved onto printed designs for Spring. These strike me as remarkably difficult to pull off. They look a little too hippy-dippy, a little too out-there, for everyday wear. Maybe with a dark, solid shirt and understated accessories? Even then, I can’t imagine patterned jeans would be flattering on anyone, especially the non-cropped versions, which is all you can really wear in Winter. Where do I even start? Many a designer sent sandal boots down the Spring/Summer 2013 runway, but this really seems to me one of the dumbest trends coming down the pike. It’s a sandal! It’s a boot! It’s both! But provides the benefits of neither! And what would you even wear with these things? I realize it must be difficult as a fashion designer to come up with something new and fresh twice a year, when it seems like everything in fashion has been done before, but sandal boots? That’s just crazy. Finally, the one January trend that doesn’t seem completely unwearable. Head scarves have been popular for awhile, but they feature prominently in the January style mags. I guess the editors are tired of wearing their scarves around their necks, even though it’s freezing out! Stick to scarves that are long and thin for the most versatility. The easiest way to rock this look is to check out those headband/scarf combos, like these. In men’s fashion, there seems to be one suit that comes into style every season, and goes out of style just as quickly. Such is the case with the khaki suit. It’s a sharp look for Spring if you can pull it off, and if you keep the cut of the suit modern: fitted jacket, slim pants. But I don’t expect to see too many guys rockin’ this look past Easter. Keep the rest of your outfit simple. 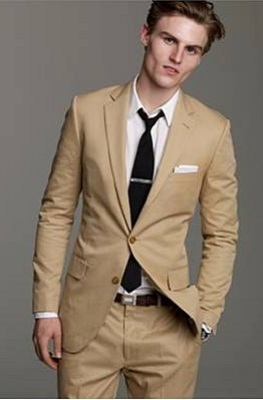 While technically a neutral, khaki in a suit is a bold color, and you don’t want your other pieces to compete. 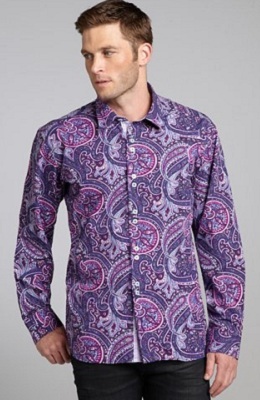 It takes a pretty confident guy to wear a printed shirt, especially a paisley print or anything in a pastel color. Checks and stripes and anything dark are much more common. This Spring, expect to see a lot more prints peeking out under blazers and bomber jackets, especially in brighter colors. A fitted shirt will look much more modern than a looser one, and you’ll want to tone it down with sober pants and shoes. And always, always tuck it in. 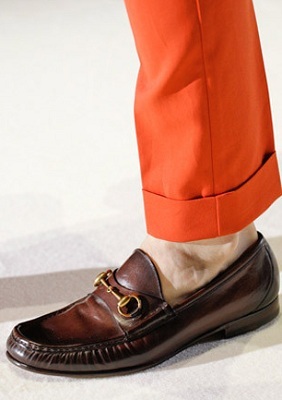 The European dress shoe has been replaced by the leather loafer as the go-to shoe of the season. These are not the Dad-shoes of the past. Luxurious-looking, but slightly worn, leather loafers give a touch of maturity to any outfit. Wear them with jeans and a blazer, or a suit. To make them really fresh, pair them with cropped pants and no socks. The only drawback is that some women might run away screaming. No one really wants to see your ankle hair. Be sure to check back every month so you won’t walk out of the house looking like a fashion trainwreck!